The 2018 Listening Room Festival brings national acts for a one-week celebration of acoustic music at the Palladium Theater and in living rooms like yours! Going To The Listening Room Festival? Just Be Quiet and Listen! If you've ever been to the Bluebird Cafe in Nashville you'll know what I'm talking about. When the show starts you best turn off your phone, settle down, and be quiet. If you don't you will likely be shushed by the staff or other customers. Most of us know the frustration of rude people making noise in the middle of a talented artist's set. It's especially egregious in an acoustic setting. I have experienced it both as the artist and listener, and that lack of respect is sooo irritating! It's why Fran Snyder, also a musician, started Concerts In Your Home now known as the Listening Room Network. He connects living rooms like yours and mine and works with us to sponsor an act of our choosing. It's an intimate evening of great music from a large network of traveling and local musicians playing concerts throughout the year. It culminates into an annual music showcase called The Listening Room Festival in April at the Palladium Theater in St. Petersburg. It all starts with a rendezvous in August at the Hideaway Café (speaking of great listening rooms) where former hosts and those interested in hosting gather to view videos of preselected acts and decide which ones they might like to bring into their homes during festival week the following April. Priority for better acts is given to former hosts and by lottery. Once hosts accept an act they are responsible for marketing their show (with the assistance of the Living Room Network) and guarantee a certain amount for the night. That's it! We scored Escaping Pavement. More about that in a minute. The entire ensemble joins The Novelists in Van Morrison's Into The Mystic to wrap up the show. Wow! The following April brings an entire week of in-house concerts and the showcase. Even if you don't attend one of the living room concerts during festival week, the showcase is worth the price of admission. This year featured acts ranging from single artists like the soulful voiced Canadian John Wort Hannam, exceptionally talented Nashville fiddle player Luke Bulla and his trio, and rockish sounds of The Novelists. The guitar and mandolin duo of Escaping Pavement, dynamic Korean sister act Chasing Lovely (who played at St Pete City Hall at the invitation of Rick Kriseman that afternoon), and Big Little Lions replete with a suitcase for a bass drum (you had to be there) rounded out the show. It was two and a half hours of musical bliss in the acoustically refined Palladium, mixed with the ability to meet the artists, buy some merch, and see all of the groups in one place. No music lover could ask for more...except, perhaps to have one of the acts play at your house. We did! Escaping Pavement, hailing from Detroit, tour around the country plating in private homes as well as more typical venues. They took part in 2018 Listening Room Festival. Emily Burns and Aaron Markovitz of Escaping Pavement hail from Detroit and travel throughout the year playing both in private homes and more standard venues. We invited 25 of our most musically inclined friends to bring a donation and a beverage beverage and experience Emily and Aaron unplugged at our place. The result was 2 hours of refined and dynamic vocal harmony blended with multi-instrumental folkish bluegrassy original acoustic music. They carry that same style into a couple of covers as well. Covers from artists like Lady Gaga and Elton John. Yes, Gaga! Yes, folksy! Yes! The whole concept has so much going for it. Living room concerts are intimate, you get to choose who you hear and who you sit next to, and there are no greedy loan shark middlemen like Ticketsmasher or Snub Hub picking your wallet to score a admission. Most concerts are unplugged or low volume and feature invariably talented artists. It's great music and allows you to support the arts and musicians who don't have a major record label yet deserve to be heard. You get to experience folks you might not otherwise hear, but will be glad you did. 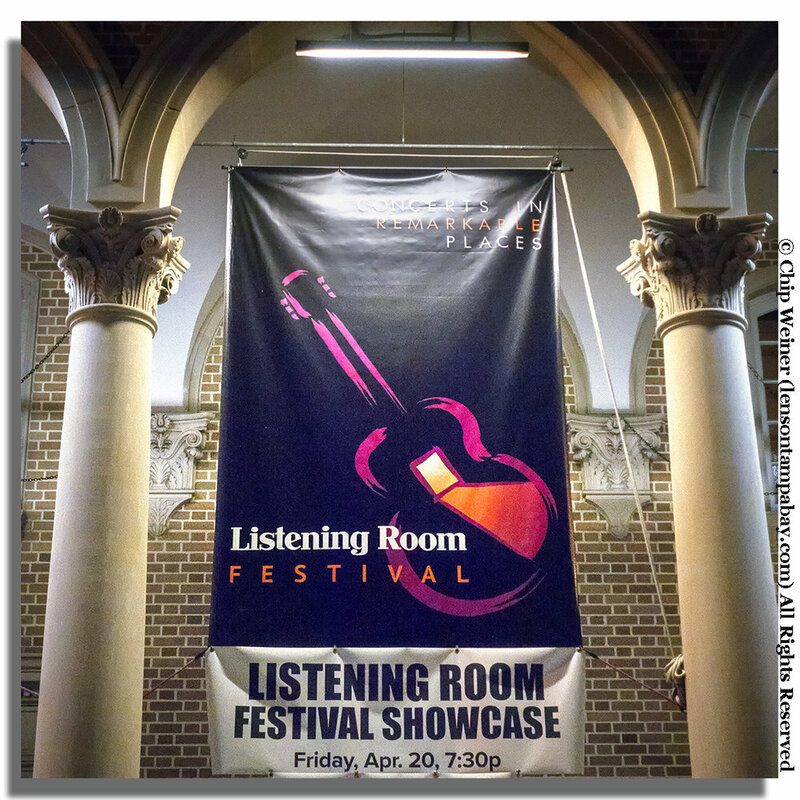 If you are interested in hosting a concert or participating in the festival next year, simply go to the Listening Room Network website to get more info or sign up. There is no commitment or money paid up front. If you like good acoustic music, don't wait. See you next April at the Listening Room Festival.